Most excellent news for fans of the Bill and Ted films – the comedy duo will definitely be going on a third adventure next year. 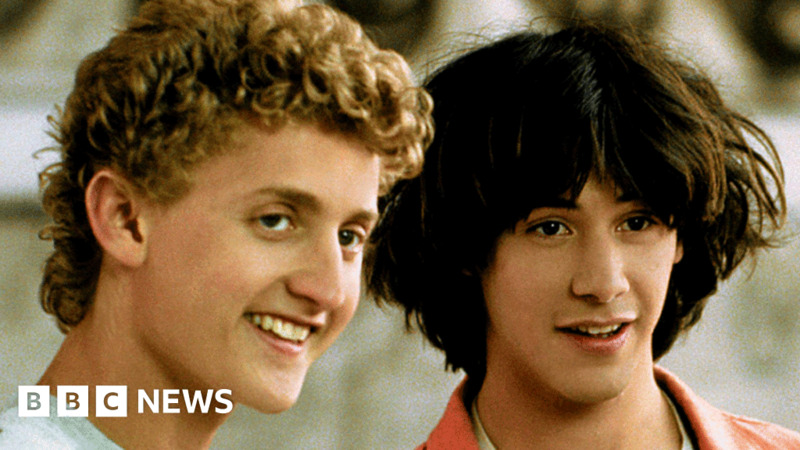 Keanu Reeves and Alex Winter, the stars of Bill & Ted’s Excellent Adventure and Bill and Ted’s Bogus Journey, revealed the news in a video message. The sequel will be released 31 years after the 1989 original, which followed two slackers travelling through time. Titled Bill & Ted Face the Music, it will hit cinemas in August 2020. Reeves (Ted) and Winter (Bill) thanked “you, the fans” for getting the project off the ground. Will the original slackers still be Wyld Stallyns in their 50s? Now ageing rockers, Bill and Ted’s inability to fulfil their prophecy to save the universe with rock and roll will be tackled in Face the Music. News that a script had been written for a third film was revealed at the Cannes film festival last year. The first two movies were big hits, with the original following the journey of two American high school students travelling back in time to get help passing a history class. Blade Runner 2049 – released 35 years after Ridley Scott’s 1982 sci-fi classic. Mad Max: Fury Road – came out nearly 30 years after Mad Max Beyond Thunderdome. Ghostbusters reboot – arrived 27 years after 1989’s Ghostbusters II. Wall Street: Money Never Sleeps – Michael Douglas reprised his role as Michael Douglas 23 years after the original. T2 Trainspotting – it took 21 years for us to be reunited with Ewan McGregor’s Mark Renton. Independence Day: Resurgence came out two decades after the original which debuted in 1996. But the sequel returned without Will Smith. Jeff Daniels and Jim Carrey reprised their roles in Dumb and Dumber To, 20 years after their first outing as a pair of dimwits. Incredibles 2 – it was a mere 14 years before Pixar rewarded fans of The Incredibles with Incredibles 2. Last year, Winter said making the Bill and Ted movies had been “therapeutic” and proved “helpful” to him, while he was coming to terms with childhood sexual abuse. Winter, now 53, says he was sexually abused as a child actor in the 1970s by a man who is now dead. “I absolutely feel like a survivor,” he told BBC Radio 5 live’s Adrian Chiles. Speaking about making the first Bill and Ted film in 1989, he said: “The movies are what they are, they’re silly and all that, I don’t hold them in overly high estimation as works of art or anything, but we had a lot of fun making them. “But for me personally, in terms of the experience… it was really, really helpful for me mentally. And it was a great environment. The news that Bill & Ted 3 is officially a go follows an intriguing report on the Forrest Gump sequel that never was. In an interview with Yahoo Entertainment, screenwriter Eric Roth revealed the unmade film would have featured OJ Simpson, Princess Diana and the 1995 Oklahoma City bombing had it not been axed in the wake of the 9/11 terror attacks. February 21, 2018 Comments Off on Bitcoin explained: How do crypto-currencies work?